As springtime approaches, many people, including myself, suffer from itchy and watery eyes. What is it about the change of seasons that seems to irritate our eyes? More often than not, it’s the allergens floating around in the air. As flowers begin to bloom and plants spring back to life, more allergens like pollen, dust, and animal dander begin to circulate through the air. While most allergies are seasonal, some people experience them all year round. We know that allergens in the air are the cause of irritation, but how exactly do they make your eyes swell and itch? Well, they cause the release of histamines in the tissue surrounding your eyes, which results in itchiness, redness, and swelling. Since allergic reactions can be more of a nuisance than anything else, many people tend to run to their local drugstore and pick up an antihistamine for temporary relief. 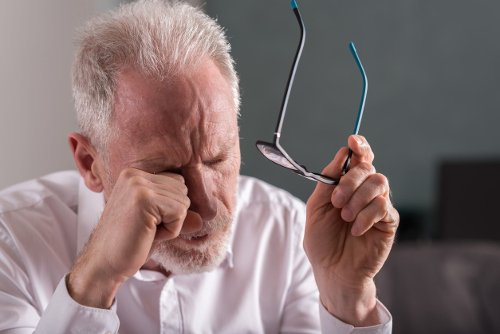 However, antihistamines can cause a number of side effects that can interfere with your daily life, including dizziness, blurred vision, dry mouth, and drowsiness. These effects can be particularly disruptive if your allergies are perennial—but how else can you treat your itchy eyes? If you’re suffering from itchy and watery eyes, I’ve got some easy tricks that could bring you relief! Over the years, I’ve tried countless home remedies so I can avoid taking over-the-counter prescriptions and found a few that work especially well for me. Many are topical treatments that will temporarily relieve your symptoms, similar to what antihistamines do—but the difference is, you won’t be subject to side effects and will likely be able to find these items around your household! Simply putting a cool compress on my eyes for a few minutes usually helps soothe the itching and swelling. Another tip is to place cucumber slices on your eyes—the vegetable has powerful antioxidants and flavonoids that will help reduce irritation. This next tip is my personal favorite: place a moist black tea bag (cooled) on the affected area for several minutes, and repeat as needed. Black tea bags are a great topical treatment for irritated eyes, as they contain bioflavonoids that will fight potential viral and bacterial infections and reduce inflammation. The tannic acid in the tea will soothe the itching, and a weak solution of cooled black tea can also be used as an eyewash. Whether you only experience a flare-up of your allergies in the springtime or suffer from them all year long, rest assured that there are simple home remedies you can use to help soothe your discomfort. While there may not be a permanent cure, there are always natural ways to find relief! Hellem, A., “Itchy Eyes: Causes and Cures,” All About Vision, December 2016; http://www.allaboutvision.com/conditions/itchy-eyes.htm, last accessed May 17, 2017. DerSarkissian, C., “Do I Need Antihistamines for Allergies?” WebMD, January 26, 2017; http://www.webmd.com/allergies/antihistamines-for-allergies, last accessed May 17, 2017. Lee, J., “10 Quick and Easy Home Remedies for Itchy, Red Eyes,” One Good Thing, September 4, 2016; http://www.onegoodthingbyjillee.com/15-home-remedies-for-irritated-eyes, last accessed May 17, 2017.